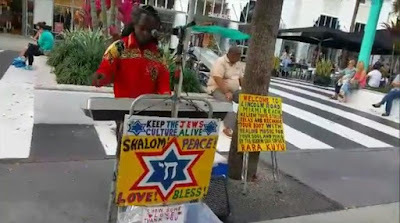 Strolling along Miami Beach's picturesque Lincoln Road mall last Friday afternoon, the last thing we expected to see was a Haitian artist and musician entertaining the passersby with a collection of Hebrew songs. But that's exactly what we saw. Rara Kuyu, a local artist and musician who graces the Miami scene, often stations himself in the center of the Lincoln Road in Miami Beach's colorful South Beach outdoor shopping mall. Rushing to get back to our apartment before Shabbat, we were only able to catch a few of his songs. While we were there, he sang Rad Halayla, Siman Tov U'Mazal Tov, and Ani Ma'amin. We wondered: Who is this street musician? A bit of research revealed that he is a popular artist who paints murals and his own van with the colors of his native Haiti. He has adopted a mission to keep the Jewish culture alive, and toward that end fills the Miami streets with Jewish and Hebrew songs. He also has created a large painting titled No More Holocaust that is based on the huge hand sculpture that dominates the Holocaust Museum in Miami Beach. 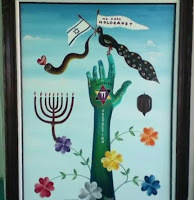 Click on the link below to see his YouTube video in which he explains the symbolism of the various parts of the painting.